Here are two of my recent designs, both that I really like - but naturally don't match ANYTHING! These rainbow ones are the same design as this striped gradient manicure that I did last month. I like these colours better though - so bright and happy! I actually had this great plan to sponge on a rainbow gradient... but after the second 'sponge' it all turned brown. Very anti-climatic! Other people have managed to do it though, so maybe I just need practice. These nails started out with me wanting to finally do a swatch of this crazily awesome hot/fluro pink polish I got a while ago. Unfortunately... I completely forgot to take a photo of just the polish. So maybe another day for that. I used a whole lots of different techniques for this one, I'll explain them below. So, I kind of have two versions of this pink one - before and after the silver was added. I still don't know what one I prefer and have no idea what one I'll post on my weheartit account. This was actually really easy to do. See the cat on my ring finger? I went to my parent's house last week and found they had a bunch of awesome and unusual hole punches - this shape, a rooster, a Mcdonalds sign... so cool. I used some electrical tape (it's nice and thick) and hole-punched a bit of it and stuck it on my completely dry nail. Next I just painted over it with black and pulled it off! Easy! And so effective! I can see myself doing this more often. For the thumb nail I finally used my striping tape I bought ages ago. I meant to paint over it and pull it off, but decided it looked better on. It gave me really thin striped that would have been pretty much impossible to paint. I then paint on more lines, gradually increasing in size. On my pointer and pinky fingers I used a stamping plate. It's all packed away now so I'm not sure what number BM plate it is but if you want to know just ask. And my middle finger was pretty easy, just used a striper brush. I added in the silver with a stiper brush and dotting tool :). Okay, rainbow one! This one isn't very complicated, but took at least three times as long. Using a striper brush, I first painted on the middle green stripe on every finger. From there I just alternated between going up and down (keeps them even and lets the polish dry) until I had all the colours of the rainbow. I cleaned up with a cotton bud or ten and went round my cuticles with a brush and nail polish remover. Done! What design do you like best - pink cats or striped rainbow? 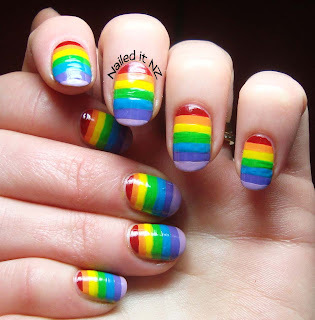 I love the rainbow mani! The colours are so bright and lovely! Thanks! I definitely like the rainbow one the best too. i like the pink ones :) with the silver. Saw this mani as your profile photo in the follower section on another blog and it popped out so much that I had to track your blog down! Awesome nail art, you rock! Oh yay, I'm glad my picture is doing it's job! Thanks heaps! That rainbow is AMAZING. Did you freehand it? Thanks! And yup I did. Took agggges haha. I LOVE the rainbow! I may have to try that now.. Thanks! If you do, let me know!